Up until this point, I haven't been too impressed with The Luxe series, with both the first and second books earning three stars each from me. Before going into Envy, I just wanted to get the series over and done with so my expectations weren't too great but I wasn't expecting horrible either. 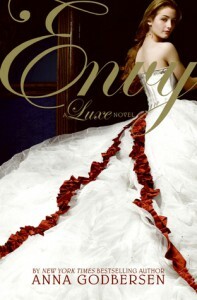 After I'd finished the book, I actually ended up liking Envy more than the previous two books. Oh look, stuff actually happens in this book! My biggest problem with The Luxe and Rumours was that there was very little going on until the end (there was more events in Rumours but still not a lot). I can only take so many parties and girls thinking while alone or walking down the street. With Envy, I took an interest from the prologue, which kept me interested in what was going to happen next. All along the way, there was a little something here and there that would keep me reading to find out more and there were very few times that I was bored. Obviously, there were slow parts of the story, but not excruciatingly slow to the point that I just didn't have the motivation to pick up the book again. I'm still unsure as to whether my hatred of Penelope is a good thing or not. She is the 'villain' of the series so she is supposed to be disliked, but every time she appears and opens her mouth I want to do horrible things to her. I seriously feel sorry for every person that has ever and ever will come into contact with her and I had no idea it was ever possible to be that much of a vile human being. That girl deserves to get even more of her comeuppance in the next book and I hope it's soul crushing to the point that she stops being so disgusting. Moving away from my issue of Penelope, I liked how all of the other characters have developed even more. I'm enjoying seeing Diana grow become more mature in the way that she handles problems and not crying over Henry all the time who is pretty much unattainable by now. Throughout the book, pretty much everyone is jealous of everyone. Diana is jealous of Penelope because she has Henry. Penelope is jealous of Diana because Henry spends more time thinking about Diana than he does about Penelope. And Henry is jealous of Penelope's brother Grayson because he gets to spend time with Diana while he has to be with his mean wife all the time. I really liked this web of jealousy, it was quite entertaining to see how everyone was jealous of each other over petty reasons and things they couldn't do much about. Overall, I enjoyed Envy more than The Luxe and Rumours, but it's a shame that this enjoyment has come so late in the series, because usually a series would start to loose its appeal by the third book. I'm glad that there was more going on and I hope that I enjoy the final book in the series this much so that I can finally put this series to bed!